Progressive Blinds: As a company who prides itself on being right at the cutting edge of window covering technology, Today’s Window Fashions is happy to introduce one of the most advanced products ever. Odysee Insulating Blinds are the world’s first blinds specifically designed for maximum insulation. Combining both horizontal blinds and cellular shades, these innovative blinds have the ability to expand and compress -- providing for superior insulation, variable light control and energy efficiency. The durable fabric vanes are easy to install and clean and come in a variety of colors. 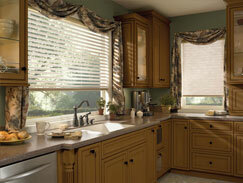 Plus, the Odysee Insulating Blinds come with a limited lifetime warranty! For a complete selection of Insulating Shades and a free in-home consultation contact your Today's Window Fashions location!